Wordpress Mobile Bulk SMS Marketing Plugin is now integrated with woo commerce infinite auto responder feature. Whenever order status is changed / customized user and admin will get notifications. Further more wordpress sms marketing plugin is available with SMS & MMS supported upto 1600 characters within a single message with Number Rotator, further more you can handle each and every single feature and settings from one place, as easy as you are adding a group in system (we guarantee no other wordpress plugin have this functionality). You can choose numbers and subscribers to send updates with options rather you want to send to new subscriber or to all subscriber. You can shuffle multiple number by selecting multiple campaigns in sequence. With advance and two way chat feature admin and subscribers can chat very effectively. All buy number options are now getting numbers with curl using single dynamic function. From time to time we have been adding more features and constantly increasing the plugin performance. In our earlier script files users were not able to immediately deliver / send messages from scheduler but now they can even send immediate messages from scheduler as well. Web widgets can also be customized nowJust some back-end changes – User can check message status on sms report page – Scheduler will show sms stats for each broadcast – Admin notifications on subscription are added on web widget – Added more possible sms status to mark number as a fake if sms not delivered to a specific number – Fake number manage feature is added. Wordpress SMS Marketing Plugin requires cron job yourinstall.com/wp-content/plugins/wp-messaging/plugin_files/run_scheduler.php for every 15 minutes each day. You must have a cron job for scheduler and campaign scheduled delayed sending. 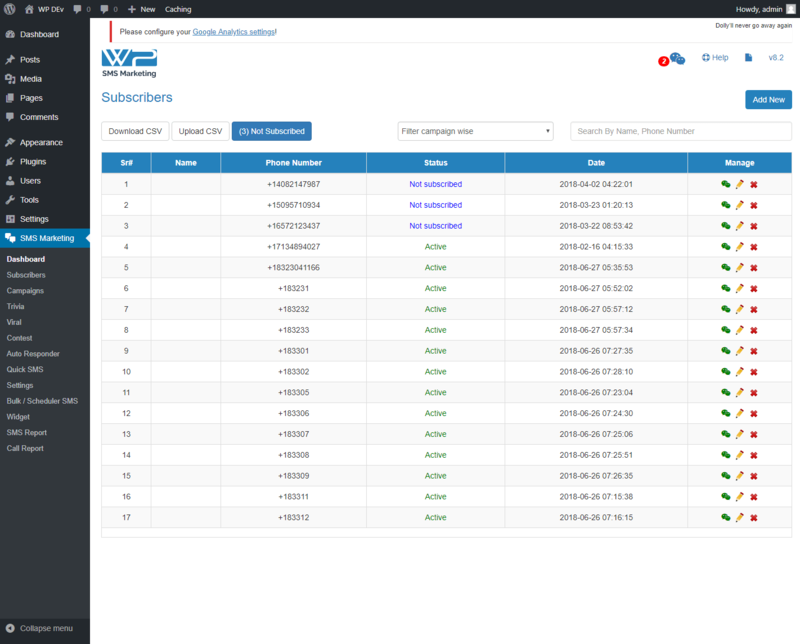 With new release of number rotating time delay depends on how many subscribers are there it can take 15 minutes if you have 2000 subscribers to send bulk messages with or without rotator. Now available with new – advance and exclusive look and feel, like never seen before. We as a team of Ranksol – web design and development company always appreciate your concerns and therefore looking forward to introduce more and more new products into the market. Sending messages from wp sms marketing plugin is very convenient and affordable. You can send unlimited messages to any network local or international without paying for additional surcharges. Texting from SMS Marketing Plugin’s plugin was never too easy and flexible before. Multisite is a wordPress feature which allows users to create a network of sites on a single wordpress installation you can run a network of multiple wordpress blogs and websites from a single wordpress installation. You can have a network of sub-domains like john.example.com or directories like example.com/john/. Open up your wordpress multisite Network for other users to create an account and get their own wordpress blogs. As a super admin you can install themes and plugins and make them available to all other sites on the network. However, other site admins on the network will not have the capability to install themes or plugins. As super admin you can change make changes to themes for all websites. Website admins can not make changes to their themes. 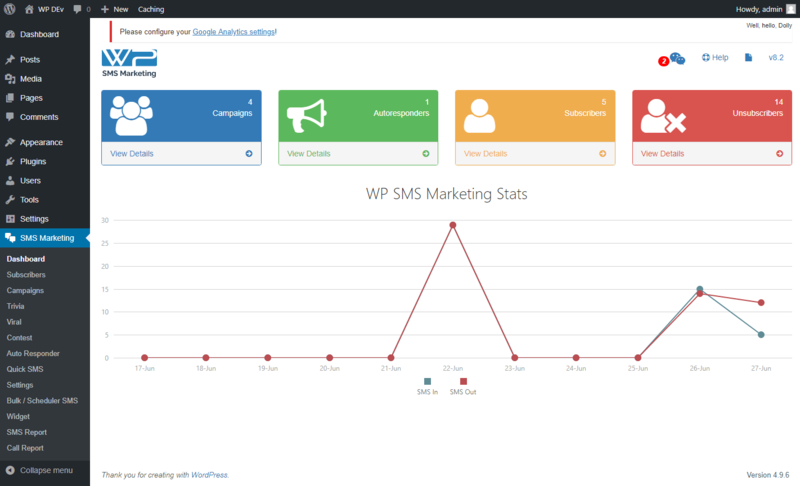 SMS Marketing Detailed Analytics System: Wordpress sms marketing comes with a detailed and advanced analytics system, (clear graphs, reports and statistics feature is already enabled to have a detailed overview about your promotional and marketing campaigns. Now you can easily track results and enhance your marketing efforts like never before. Campaign Management & Scheduling System: Wordpress SMS Marketing plugin allows you set, maintain and schedule unlimited campaigns with no boundaries at all. For the very first time at the World Wide Web, this unique and innovative sms marketing plugin now supports MMS Campaigns as well. Very Affordable and low investment: Whenever a new customer or a developer is planning out to buy such types of amazing plugins, their prices are too high that not even a single person could afford these powerful plugins. But Not anymore. This SMS Marketing plugin is available exclusively at envato market with lowest and most cost effective rates ever. So what are you waiting for? Just grab your plugin and start promoting your company, products, business and take your organizations presence to the next level. Images MMS Logs Feature: Before wordpress sms marketing plugin, thinking of more than 2 business campaigns was not even possible. But now you can comfortably generate your SMS Marketing campaigns upto unlimited promotional and business campaigns. Upto 10 promotional and business campaigns support: Now with the help of wordpress SMS Marketing plugin you can schedule and generate upto business campaigns in which you can send multimedia .jpg images to your subscribers all across the globe. Like never before, upto 10 mms / sms campaigns. Only One Time Payment – No hidden fees: In order to have such sort of brilliant plugin your possession, one must have to pay hundreds and thousands of dollars to keep it going for the mark. At promotion king we don’t charge for any future updates or even new features which we add on. All new features which are soon to be added in this plugin are not even charged in pre-order price. Order now for just as low as $19 with complete money back guarantee. 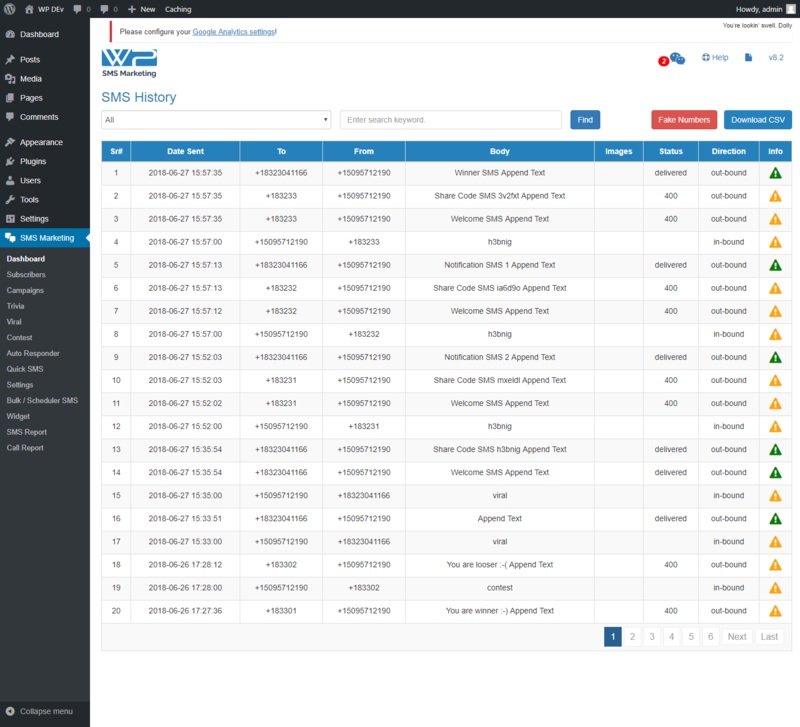 24/7 Help Message Control Feature: It’s been seen and have noticed many times that whenever a customer or a client purchases an application, theme, plugin or a order a business website for development they are charged for support and for any technical errors. But we are offering wordpress SMS Marketing plugin for as low as $19, with complete money back guarantee and 6months extended support. Start, Stop Subscriptions control: Wordpress SMS Marketing plugin allows users to subscribe under any promotional campaign. You can change, edit or turn off your subscriptions plan with it’s advance subscriptions control system. Dual Message Support Feature: Like any other mobile or business phone. Same like texting over your mobile phone, With help of wordpress SMS Marketing plugin you can quickly send your business and marketing promotional messages with complete ease. Bulk SMS Sending Feature: Bulk sms or mass sms sending is another outstanding feature of wordpress SMS Marketing plugin, Our bulk sms sending feature allows sending sms & mms in bulk to anyone and anywhere in the world with no restriction at all. Selective SMS Sending Feature: Wordpress SMS Marketing plugin allows you to easily choose or answer sms messages and select to answer for your mobile phones on your behalf. This plugin is a must buy. So stop wasting much of your precious time. Order now and expand your company’s presence along with your brand’s vision. Featured Version Is 4.11: By the time being and with the latest advancement and changes as per our clients and customers requirements, our dedicated and professional team of programmers keeps updating this versatile plugin to meet all of your needs. Wordpress SMS Marketing plugin latest version is now 4.11, in case after purchasing you haven’t upgraded to the latest version yet then we strongly advise you to please update without any data loss. Campaign Delayed Sending System: Same like a timer or automatic timing scheduler. Wordpress SMS Marketing plugin allows you to appropriately finalize your receipt count and the end or at the send time for your campaign. Fully Responsive Feature: Our excellent and powerful Wordpress SMS Marketing Plugin is designed for small and large scale corporate businesses. We are striving for excellence and trying to deliver top notch most cost effective solutions for you and your company, our sms marketing plugin allows promoters to instantly connect and interact with customers on the go. Wordpress SMS Marketing Promotional and bullk sms marketing plugin allows promoters and entrepreneurs to gather leads or customers’ mobile numbers, business names, email addresses, contact information, zip codes and much more. Deliver mass text SMS message blast to your customers, members and respond to subscribers with our easy-to-use wordpress based SMS Marketing plugin, you can use it easily on iPhone APP or even from E-mail. Marketers can send offers, special offers, discounts, service/product up-dates etc via SMS Marketing messaging plugin anytime anywhere in the world. Time Zone Auto Detection Feature: Depending upon your area or country, even in many states time zones differs. Wordpress SMS Marketing script gives you exact time zone info in order to lose any unsaved data and it represents your promotional campaigns time preferences in a better way. For the very first time, you don’t have to update your time zone each and every time. It automatically detects time zone by itself. Multiple Segments Handling Feature: How many applications or plugins allows you to perform multiple segments? As far as we have known not even a single one. Wordpress SMS Marketing plugin is a featured application which allows user to perform multiple tasks at the same time without any interruption. Unmatched efficiency: Wordpress SMS Marketing plugin is not just efficient and works brilliantly on all devices or websites. It’s efficiency is unmatched with any other plugin available in the market. That’s why are not just only offering it for as low as $19. But we are presenting it to you with complete money back guarantee. It’s one of the most powerful yet easiest plugins to use for bulk sms sending and mobile SMS Marketing . 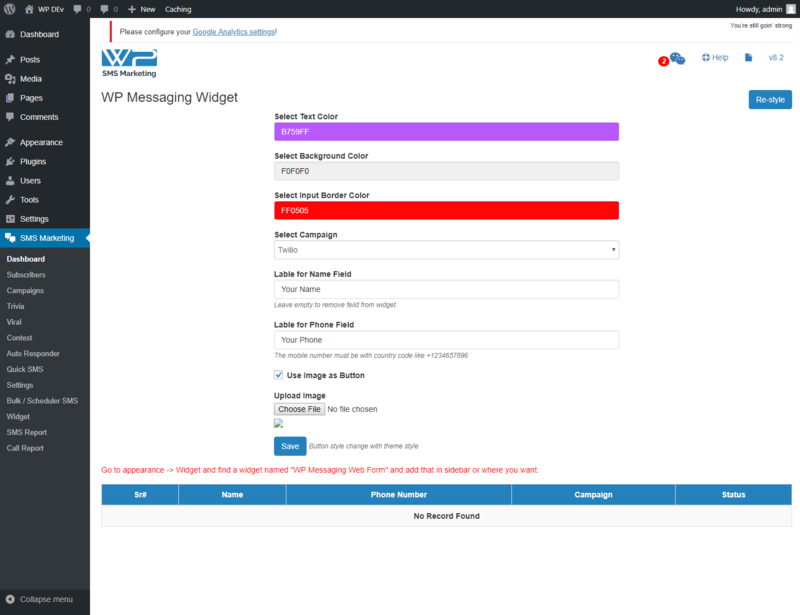 Advance Widget Support Feature: Wordpress SMS Marketing plugin is a very powerful plugin, not just it automatically get to know your time zone but also you can get in touch with your clients and customers 24/7 by placing it’s sleek widget anywhere at your business website or blog. Widget Customization Feature: In order to customize your wordpress SMS Marketing plugins widget you don’t have to make unnecessary and custom changes in it’s .css files each and every time. For our clients and customers feasibility, we have designed it in such way that customization is way too easy. Powerful And Extravagant Feature: Wordpress SMS Marketing Plugin reveals up a direct, considerable, and trackable marketing route with your clients, customers and viewers. Right now you put your advertising and marketing efforts out there and wait for a reaction. You have to wait for orders at phone calls, you wait for users to visit your website check out, or a reaction by mail or a visit directly to the store. Wouldn’t it be great if customers could react to your marketing and promotional campaigns instantly – as soon as they see or hear the advertisement? The entrepreneur or business owner gets the lead instantly to act upon it. Promoters and entrepreneurs can catch more leads and can grow their business with written text messages as to analyze other channels. Our unique and innovative wordpress SMS Marketing plugins allows viewers advertisers and promoters to respond and reply to their clients and customers 24/7 and the best part is that you don’t lose any sales lead or data, all SMS Marketing requests are stored along with mobile numbers, date, time and proper contact information. Widget Integration Feature: Integrating any other plugin requires a lot of technical knowledge and skills. But we present wordpress SMS Marketing with complete ease of access. Integrating our SMS Marketing plugin is very easy that even a lay man can implement at his/her business website or blog. Advance Widget Log Feature: Simply just place wordpress SMS Marketing plugins short code to use login form in your pages / posts. All you have to do is just install the plugin and add login widget. Cost Effective And Very Affordable: We are not saying that for us 1500 dollars is a magical number, but you’ll agree that how many plugins out there possessing such outstanding features costs? If you have to design it for your self then it’s going to cost you a fortune for sure. But only at code-canyon for the very first time we are offering at an incredibly low price of only $19 with complete money back and free 6 months support. 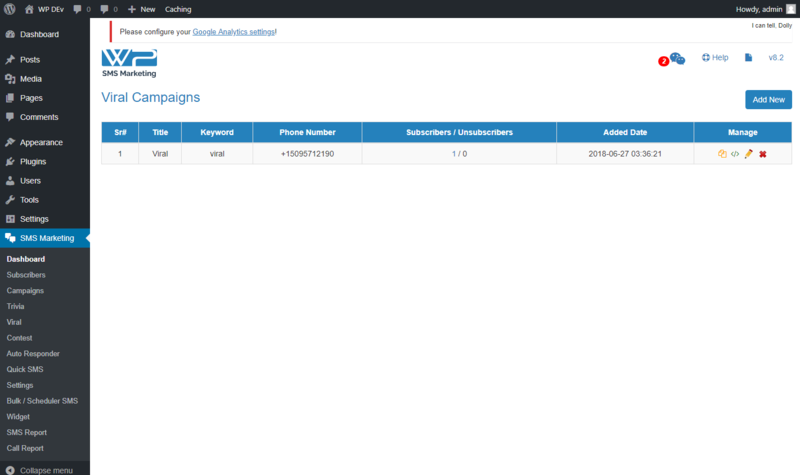 Calls Subscriptions Feature: This feature is specifically designed to facilitate you with a further next step. Now you can schedule unlimited campaigns and can easily subscribe to limitless campaigns. Also there is no limit of users or customers falling in a specific campaign. Voice Speech Based IVR Feature: Placing an ivr at your customer support center is one of the most essential things for any business or organization in order to satisfy your clients and customer and usually such devices are not too cheap. Average cost of a simple IVR is round about $50 – $100. Our advance IVR system reduces your cost per call allowing clients select the kind of help they want such as self service or speaking to customers support representative. Time And Efforts Saving Features: We believe an SMS Marketing and promotional service should be simple to use, simple to manage, easy to operate, easy to navigate and also must be real helpful in personalization, which is why we make releasing a customized SMS Marketing and advertising campaign a really fun, affordable, and fast job. With our wordpress SMS Marketing messaging plugin, your promotion team can send mass SMS strategies in the U. s., Canada and anywhere in the world for low cost and with no problem of stress at all. 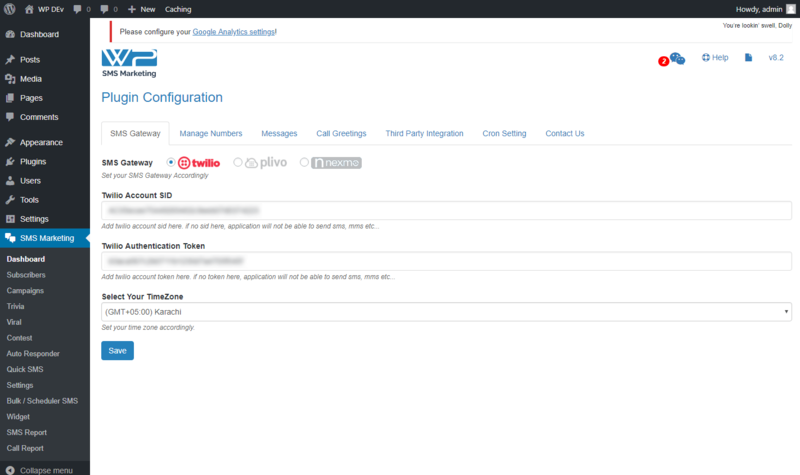 Call Input Subscription Feature: If you have to specify wordpress SMS Marketing plugins input value as true. The call will only return back once all subscribers have been added in their campaigns and subscriptions. SMS Subscriptions Feature: In wordpress SMS Marketing plugin customers / users can subscribe to any sms campaign of their choice by only dialing a single string *445# or you can allow customers to subscribe under any promotional campaign by pressing numbers (for example press 1 for pizza subscription, press 2 for Christmas deal campaign, press 3 for pizza deal campaign and so on. Manual Subscribers Addition Feature: Now with wordpress SMS Marketing plugin you can manually add, import or modify a subscription any time from admin dashboard. You can manually add a subscription and can easily add unlimited subscribers into any promotional and SMS Marketing campaign. Grow Sales And Enhance Business Opportunity Feature: Not every plugin offers promotional chances and allows you to grow your business. Wordpress SMS Marketing is a features plugin specifically designed for small businesses, large scale companies and organization to avail many opportunities like bulk sms, ivr, sms subscriptions, campaigns management, handling and much more. As compared with this medium of advertising; banner ads and TV commercials are too much expensive and not every business man can afford it. Import / Add Subscribers List By .CSV Feature: For our clients and customers feasibility we have designed it accordingly by keeping in mind the core function and necessities of a SMS Marketing plugin. Before this feature, it was really hard to add subscribers manually one by one in your subscriptions list. But not anymore, you can easily import subscribers / contacts from a .csv , .txt or excel file to a new list or an existing one. Assign message to specific or selected number of subscribers Feature: With word-press SMS Marketing plugin advance features now you can easily assign messages to a specific contact list, so by using wordpress SMS Marketing plugins “custom pages” you can easily assign messages to specific persons or to a group of subscribers with complete ease. Set Auto Responder Feature: Same like any automatic responding application, in case you are somehow not available to attend and facilitate your clients and customers with proper care and attention as they deserve. We have enabled automatic responder in wordpress SMS Marketing plugin which communicates on your behalf even if you are busy in meetings or currently out of time. Auto Responder Back Notification: We’ve got solutions for all of your needs and problems. That’s why in order to overcome such requirements in future; we have placed such brilliant features today. Wordpress SMS Marketing plugin works on your behalf, in case you are too busy and have forgotten to respond to your queries, our auto respond back notification can do that for you. Auto Responder Two Way Notification Feature: As an unmatched SMS Marketing plugin and an innovator in mobile SMS Marketing industry, we have to implement such features which are rare and not implemented in any other one. With this feature of wordpress SMS Marketing plugin now you can easily shuffle multiple numbers and can respond two way. Super Charged – Exclusive Plugin: We are proud to say that wordpress SMS Marketing plugin possessing such brilliant and super charged features is exclusively available only at code canyon and we strongly appreciates envato market for their coo-operation with us and allowing us to make their site even more trust worthy of such valuable products. Mobile Notification By SMS Feature: Push notification and sms are all popular methods of communicating with clients and customers. Now you can easily send mobile sms notification to your clients without any complications. Email Notification Feature: What else can anyone have thought off before buying this powerful plugin. With word-press SMS Marketing plugin now you can’t even miss out one single update with it’s advanced notification by mail feature which allows you to send and receive notification messages any time your email address as well. Multiple Number Assignment Feature: There’s no such distinction between initialization and assigning task. What you want to do is not initialization, but assigning task is much more complicated that initialization. Wordpress SMS Marketing plugin allows numerous and multiple assignments, as soon as the list of numbers is evaluated. Multiple Campaign Management Feature: Our multiple campaign management features allow users to define, orchestrate and communicate offer to customers all across the globe with no limit of subscribers at all. Retrieves Your Existing Number For Twilio Feature: Don’t know about your existing number at twilio, don’t worry wordpress SMS Marketing plugin can do that for you. Toll Free Numbers Feature: With wordpress SMS Marketing plugin toll free numbers you can extend up your business reach, enhance sales, grow potential of your customers, facilitate your customers and provide your corporate clients with essential mobile sms and business marketing features. 3rd Party Integration Feature: With our recent update in version 3.2 & Version 3.3, we have launched an advance api system to integrate wordpress SMS Marketing plugin with any third party system. Wp SMS Marketing plugin is multi-functional can be integrated with any third party API as well. 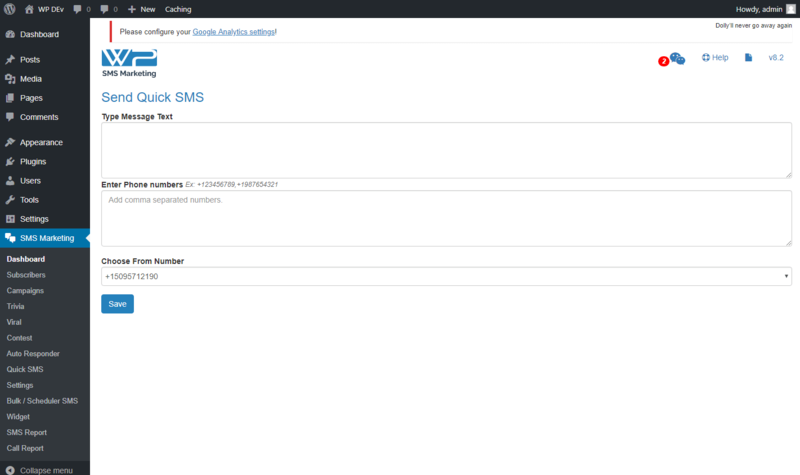 V2 - Stable with MMS Support and Selection IVR, more reliable. V2.1 - Number Rotator, Selection BULK sender and bug fixes. V3 - 1600 characters are now supported in SMS & MMS. V3.3 (3-02-2016) - Update some process and code files to improve the efficiency of plugin. Third party integration is completed and launched. V3.4 (5-02-2016) - Fixed the MMS issue with Twilio Library. V3.6 (9-02-2016) - Multiple MMS Images improvements. 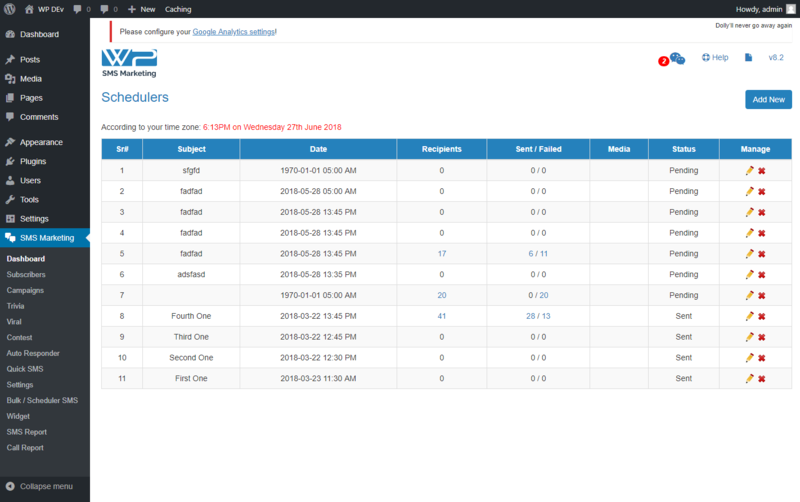 V3.7 (11-02-2016) - Bulk SMS sending process improved, Description of each input field is added. V4.4 (10-03-2016) - Updated graph on dashboard. made some SMS fields optional. V4.11 (02-06-2016) - Script added to send scheduled messages. V5.2   (03-01-2017) - All buy number options are now getting numbers with curl using single dynamic function. The plugin performance will be increased. Updated plugin size is reduced to only 655KB from 7MB. V 5.5  (31-01-2018) - Plugin settings has been categorized in different tabs accordingly. V 5.6 (01-02-2018) - Server side script is updated. V 8.1 (22-06-2018) - Added more possible sms status to mark number as a fake if sms not delivered to a specific number. 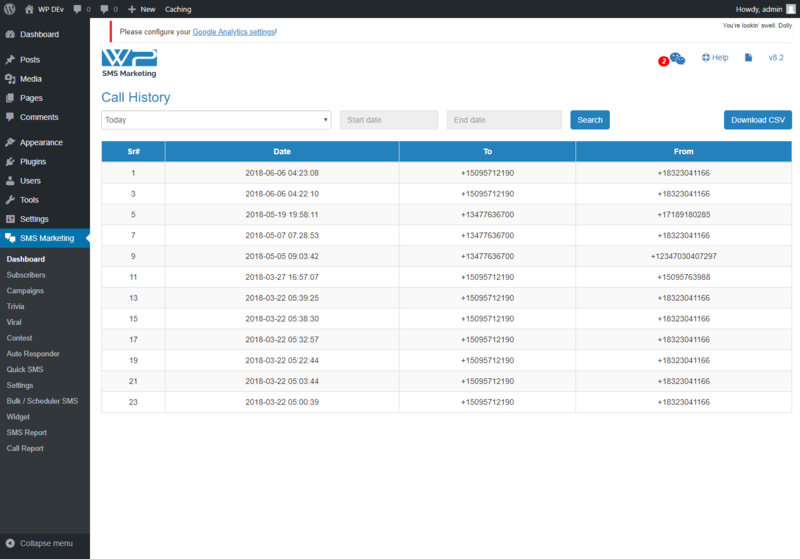 V 8.2 (25-06-2018) - Fake number manage feature is added. V 8.6 (2-09-2018)  - Contest messaging campaign added - some more changes at back end.